The way you watch and create YouTube videos on your phone is about to change. YouTube is unveiling a redesign to its mobile app, visible right away on Android devices and coming soon to Apple devices. The app has a "streamlined design," YouTube says, with three main pathways: a personalized home page, a subscriptions page for channels that users have signed up for, and an account page. The app updates were announced at VidCon, the annual online video conference in Southern California, where YouTube CEO Susan Wojcicki gave a keynote address. "We're focused on three top priorities: mobile, mobile and mobile!" Wojcicki said. Why? Because, as Wojcicki said, "more than half of our views come from mobile devices" and "mobile revenue is growing 100% year-on-year." Wojcicki said the app redesign also makes it easier to create videos and upload them directly to YouTube from a mobile phone. The app includes basic editing and filtering tools. Wojcicki also said it has "vertical video playback," a new trend in video production popularized by Snapchat. She hinted at more features coming later in the year. 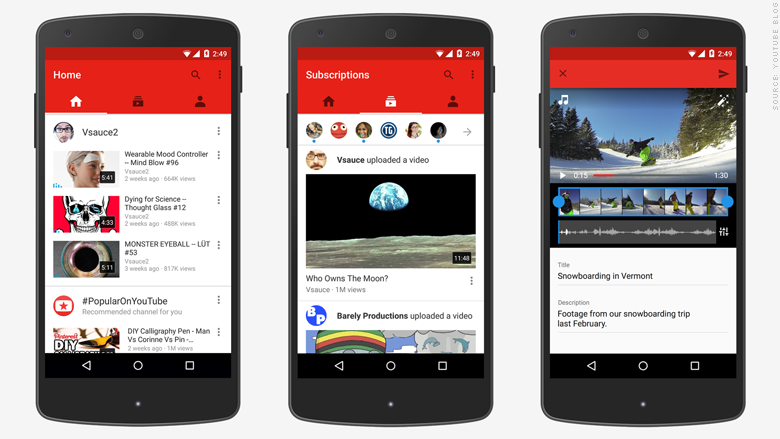 Separately, YouTube launched a new app earlier this year specifically for kids. YouTube, which is owned by Google (GOOG), is by far the world's biggest video viewing site. But it is facing new competition from Facebook (FB), Twitter (TWTR), Snapchat, and a bevy of other rivals. That's why it was notable that Wojcicki said in her keynote that "YouTube just had its best year ever," and thanked the video creators in the audience for helping make that happen. YouTube says that total watch time is "up over 60% year over year," its fastest growth rate in two years. The site wants to make its top video makers feel appreciated -- and to that end, Wojcicki touted the three new production spaces that YouTube opened in the past year, in New York, Berlin, and Sao Paulo. She said two more will open next year, in Mumbai and Toronto. She described the video creators as a "massive part of the reinvention of television." "We're finally in an era," she said, "where diversity on the screen reflects the diversity of our society."